I admit, I’ve never been a big Nigel Slater fan. Lately though, some of his simple, hearty supper recipes are starting to win me over. 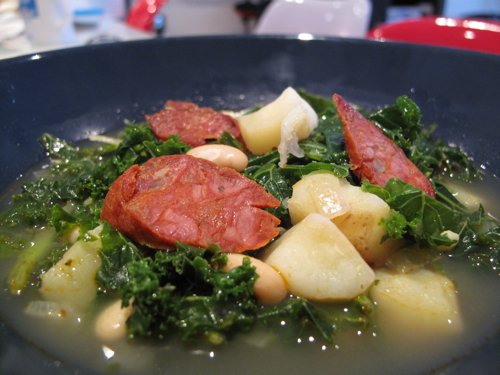 This Portuguese Kale and Potato broth recipe is a real winner of a winter warmer… ideal for these cold, dark and soggy January weekends. Best of all, its dead easy to make – done in under 30 minutes form start to finish. As Nigel has suggested, I’ve spiced up the soup with slices of pan-fried Chorizo used Chicken stock as a base to increase its depth of flavour. In a large stock pot, sweat the chopped Onion and Garlic with a glug of Olive Oil on a medium heat for 2 – 3 minutes. Next, add the Potatoes and cook for a further 1 – 2 minutes. Now, add about 1 litre of hot water and the Chicken Stock cube and simmer on a low to medium heat for 20 minutes. While the broth is simmering away, pan-fry the sliced Chorizo in some olive oil for about 2 minutes on each side, reserving the lovely paprika flavoured oil that is released. Remove the cooked chorizo from the frying pan and set aside. Now add the Cannellini beans and lightly fry in the Chorizo-flavoured oil for 2 – 3 minutes. When the broth has about ~7 minutes left to go, add the bag of Curly Kale and Cannellini beans to the broth. Once everything is cooked, take the pot off the heat and season to taste with sea salt, black pepper and a pinch of paprika. Add the Chorizo and serve while hot.